اندرکنش خاک – سازه اختلاف موجود در پاسخ های سازه را درشرایط واقعی و تئوری با فرض تکیه گاه صلب بیان می کند و به مشخصاتی همچون سختی، جرم و میرایی خاک و سازه بستگی دارد. 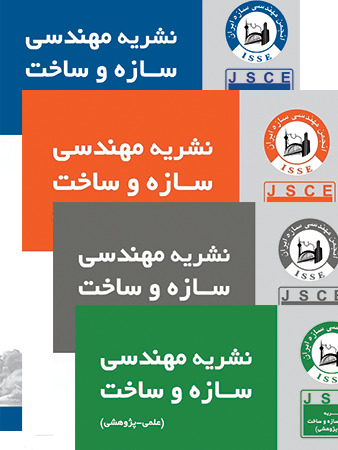 ساختمانهای دارای قاب خمشی از جمله سیستمهای سازه ای هستند که امروزه از فراوانی نسبتا بالایی برخوردار هستند. در این نوع قابها شکل پذیری توسط عواملی همچون تسلیم خمشی تیرها، ستونها و تسلیم برشی چشمه اتصال ستون حاصل می گردد. در این مقاله، تاثیر مدلسازی اتصالات تیر – ستون و اندرکنش خاک – فونداسیون - سازه بر پاسخ لرزه ای ساختمانهای 10 طبقه با سیستم سازه ای قاب خمشی فولادی متوسط واقع بر خاک نوع IV دارای سرعتهای موج برشی 150 و 80 متر بر ثانیه و خاک نوع II با سرعت موج برشی 560 متر بر ثانیه ارزیابی شده است. اتصالات بکار رفته برای این ساختمانها از نوع اتصالات از پیش تایید شده ی جوشی به کمک ورقهای روسری و زیرسری (WFP) هستند. به منظور بررسی عملکرد این ساختمانها، مدلهای اجزای محدود دو بعدی با فرض لحاظ اثر خاک و اتصالات، لحاظ اثر خاک و عدم لحاظ اثر اتصالات، تکیه گاه صلب و بدون لحاظ اثر اتصالات توسط نرم افزار OpenSees ساخته شده اند. این مدلها تحت تحلیلهای دینامیکی تاریخچه ی زمانی غیرخطی قرار گرفته و حداکثر پاسخ آنها با یکدیگر مقایسه گردیده است. نتایج بدست آمده نشان می دهد که در مدلهای واقع بر خاک نوع IV، لحاظ اثر خاک و اتصالات و یا فقط اثر خاک، منجر به افزایش حداکثر تغییرمکان جانبی و حداکثر تغییرمکان نسبی بین طبقه ای نسبت به مدلهای بدون لحاظ آنها و در مدلهای واقع بر خاک نوع II منجر به کاهش برخی از این پاسخها می گردد. در کلیه ی مدلها، لحاظ این دو عامل باعث کاهش حداکثر برش پایه می شود. Soil-structure interaction expresses the difference of structural responses between the actual and theoretical rigid based conditions, and depends on the stiffness, mass and damping of soil and structure systems. Nowadays, moment-resisting frame is one the most applicated structural systems. Ductility of these frames is due to the flexural yielding of beams, columns and the shear yielding of panel zone of columns. The influence of modeling beam-column connections and soil-foundation-structure interaction on the seismic responses of 10-story intermediate steel moment-resisting frames that located on the soil type IV with various shear wave velocities (150 and 80 m/s) and soil type II (with shear wave velocities 56 m/s) is studied in this paper. Prequalified welded flange plate connections (WFP) are used in these buildings. For this purpose, several 2D finite element models are developed using OpenSees software by assuming three conditions such as models with considering soil and beam-column connections effects, models with considering soil and without connections, models with fixed based and without considering connections. The maximum responses of the studied frames are calculated and compared with nonlinear time-history dynamic analyses. The numerical results show that in the models located on soil type IV, considered connections, SFSI, or just soil, the maximum lateral displacement and maximum inter-story drift are more, compare to models without connections and with fixed based conditions. In the models rested on soil type II, some of these parameters are reduced. The maximum base shear of structures is reduced in the mentioned models.